To help you plan an epic night out, we reached out to our readers on Facebook and Instagram to retell their successful first date stories and share the special activities that won them over. And, of course, we sprinkled in a few tips and suggestions of our own along the way. These 50 first date ideas in Orlando are sure to be a slam-dunk. Tip: Looking for more nerdy date night ideas? Try Nerd Nite Orlando, arcade bars like Player One and Joysticks and the adults-only and after-hours events at Orlando Science Center. Tip: The Baldwin Park First Friday Festival is a monthly event held on the first Friday of each month from 5:30-9:30pm. At this free event, you’ll find more than 70 local artisans displaying their work. Tip: Enzian Theater is one of our date night go-tos. Here are 8 ways to do date night at this Orlando gem. Tip: Here’s a guide to the Perfect Afternoon on Park Avenue to give you a few ideas of what to do during your stroll. Follow the @parkavewp Instagram page for all things Park Avenue! Tip: Take your date to an out of the ordinary bar for fancy sips. We love The Courtesy (go over the top by booking two seats for the monthly cocktail class), Hanson’s Shoe Repair, M Lounge and Mathers Social Gathering. If you’re both beer lovers, scan the Central Florida Ale Trail map and choose one brewery each to visit together. Pro tip: pick breweries in walkable areas (think DeLand, Winter Park and Downtown) so you can pair your brewery visit with a stroll to explore the local area. Tip: Dexter’s can get noisy inside, so snag a table outside on the patio. Tip: Looking for a spot to grab drinks? Get a few ideas from our Plant Street Pub Crawl post. Tip: You can rent swan boats at Lake Eola from the dock by Relax Grill Sunday – Tuesday from 10am-7pm and Wednesday – Saturday from 10am-10pm. The cost to rent is $15 per half hour. Tip: Check out our guide to where to dine with sunset views for more romantic sunset dinner ideas. Tip: Restaurant Row is the perfect place to plan a progressive date. Try an upscale happy hour crawl, or pair dinner with drinks at the area’s speakeasy, Pharmacy Orlando. Tip: Here are a few more ideas for how to do date night in Celebration. Don’t forget to stop by Wonderland Cookie Dough for dessert! Tip: Ivanhoe Village is Orlando’s most romantic Main Street District! It’s so romantic we wrote a post detailing all of the amorous activities to explore together. Tip: Visit Jiko – The Cooking Place to try African cuisine before strolling through the resort to explore the Savannah. Tip: Light Up UCF is a seasonal event, but you can ice skate year round at RDV Ice Den. Multiple readers suggested this charming Italian eatery for a first date and we have to agree. At Prato, you’ll feel like you’re dining at a trendy NYC restaurant. And you just can’t go wrong with pizza. They’ve got a great happy hour, too! If you’re nervous about committing to an entire dinner, try attending a food truck event instead. The chill atmosphere is ideal for a casual first date. 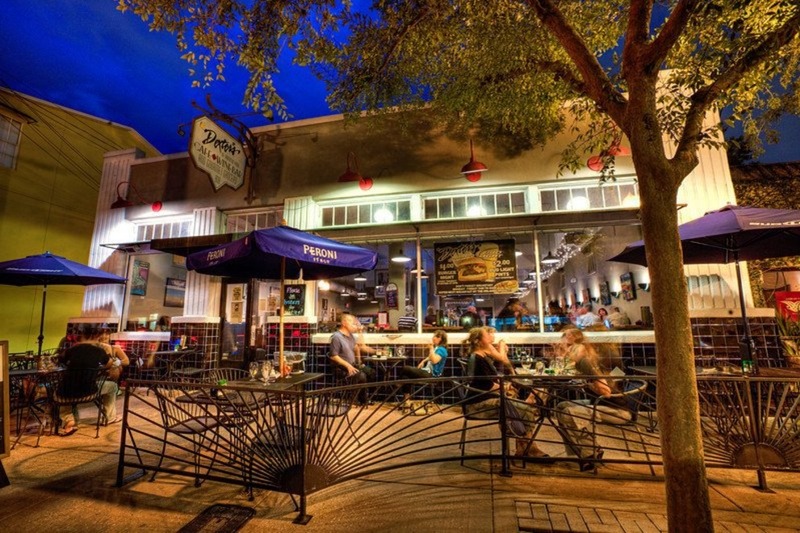 We love Tasty Takeover in the Milk District, which happens every Tuesday night. Tip: Mini golf isn’t just for kids; it’s an awesome first date idea! We also love Congo River Golf on I-Drive. Extend the evening by grabbing dinner beforehand (try Marlow’s Tavern or Tapa Toro), listening to live music at Tin Roof or riding the ICON Orlando. Here are a few more suggestions for an I-Drive date night. Want to up the fun factor? Try this inventive take on a miniature golf date night. Tip: You don’t need to enter the theme parks to watch the fireworks. There are tons of places outside the parks to catch the nightly show. Parking is free after 6pm and there are tons of restaurants and bars to discover. Follow our itinerary to get started. “We had a surprise picnic at Lake Eola. Surprise because we agreed not to tell the other what we were bringing. Tip: Disney’s BoardWalk is another fun location for a progressive date. Yes, Bok Tower Gardens is a bit of a drive from Orlando. But the scenic setting is extra romantic, the gardens are peaceful and quiet and admission is reasonable. Pro tip: Admission is half off for Florida residents the entire month of August. Like food truck meet-ups, farmers markets are casual and the variety of vendors and things to see means you’ll never run out of things to talk about and explore. A few of our favorites include the Orlando Farmers Market (Sundays) and Winter Garden Farmers Market (Saturdays). Bonus: they’re totally easy on the wallet. Build your own picnic basket with provisions from Swine & Sons or East End Market before watching the movie. This way, you’ll both get to select food you enjoy. The casual setting quells some of those first date jitters while the experience is unique enough to make a great first impression. Check the calendar for upcoming movies. Also try: Popcorn Flicks in the Park in Winter Park. Tip: Looking for more vegetarian and vegan-friendly date night eats? Here are a few of our favorites. This is the perfect place to spend a Sunday and there’s no shortage of options for brunch. A few of our favorites are Soco Thornton Park, Dexter’s and The Stubborn Mule. Regardless of whether you’re vegetarian or not, this plant-based eatery is a hip place to meet for the first time. A newcomer to College Park, Tartine is a cozy wine bar that’s casual yet refined. It’s a wonderful spot to meet for lunch, brunch or dinner. Tip: This post all about dancing dates will give you tons more ideas for a bold first date if you’re feeling risky! Tip: Here are a few more zip lining adventures to consider. By day, paddle along Rock Springs Run in a clear tandem kayak with Get Up and Go Kayaking, and by night, experience bioluminescence on the space coast with nighttime tours led by A Day Away Kayak Tours. Both are sure to wow your date. It doesn’t get more Florida–or more fun–than speeding around in an airboat looking for alligators. Try it at Wild Florida, The Black Hammock and Boggy Creek. We know it’s not the most romantic, but it is adventurous and unique and you’ll have loads to talk about over dinner after your ride. Where was your first date in Orlando? Share it with us in the comments!